Fillings, which are used to fill the space left by a cavity, can come loose, crack, and sometimes even fall out completely. While a lost filling isn’t always considered a dental emergency, it can cause pain and be uncomfortable. If this happens, there are several things you can do before your visit to our Clinton Township dental office. When a filling is lost, it’s more important than ever to keep the area as clean as possible. The divot in your tooth where the filling used to be is a great place for food to collect and bacteria to lurk which can end up causing more damage. To keep the area particle free, it’s a good idea to rinse with warm salt water and brush the area gently after eating. It’s also not uncommon for your teeth to become sensitive or a bit painful after losing a filling. If this happens, try an over-the-counter filler material with zinc oxide to place into the gap and take some pain reliever. Remember, this is a temporary solution and an appointment at our dental office in Clinton Township is still important. The single most important thing you need to do when you lose a filling is call your Clinton Township dentist. At your appointment, we’ll examine where the filling was and talk with you about the best option to restore your tooth to healthy and strength again. Often, we can replace the old filling with a new one. However, there are times when, if the filling was quite large, we may need to talk about another option, such as a crown. While fillings are a great treatment method to fix cavities and other dental problems, they can become loose or fall out due to some of our habits and food choices. Fillings are at increased risk for damage and falling out if you eat hard or sticky foods, or clench and grind your teeth. The best way to avoid a damaged filling in the first place is to be careful what you eat and talk to us if you clench or grind as you could be causing more damage to your smile than just losing a filling. If your filling has become loose or has fallen out, don’t hesitate to call our Clinton Township dental office as soon as you can. 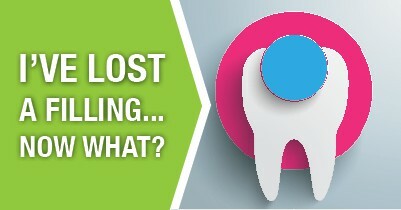 We’ll check out what’s going on, discover what caused it in the first place, and get your tooth back in tip-top shape.